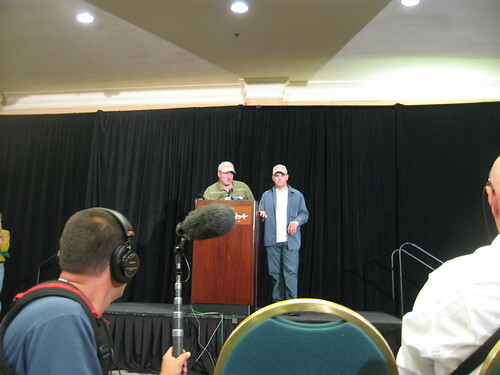 Well, I can hardly believe that I was able to make it into the “press only” press conference today at a hotel in Palo Alto. The big guys were there, with their trucks, satellite dishes, and honkin’ big cameras. The woman at the door asked me who I was with, so I said, “I’m a blogger” and handed her a business card that has a photo of me on it. She handed me a press kit, asked me to sign some waiver, and welcomed me. 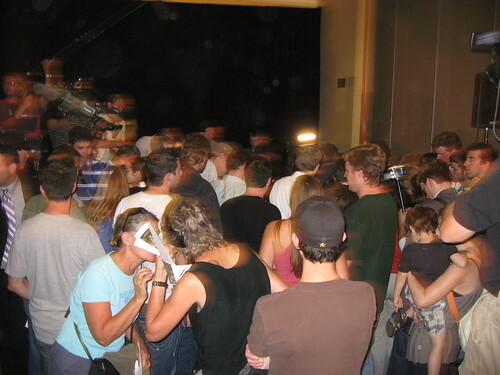 I entered a room that would soon swell to several hundred people, ranging from top-tier press to bloggers, including Jason Kincaid from TechCrunch, to random locals and a guy in a Bigfoot costume. 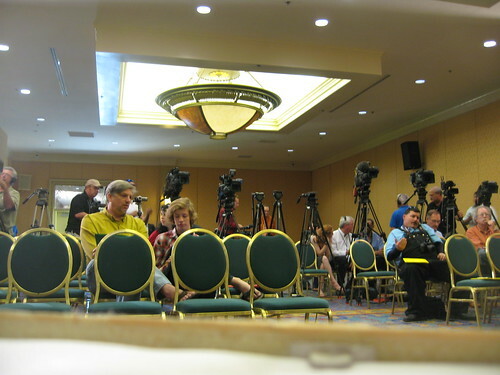 I am in the room where the Bigfoot press conference will be. Sweet! we are told that we will each get a new photo and the dna test results. big whoop. I have to say it was a terrible disappointment, and a complete disaster of a press conference. And I’m not talking about the idiot charlatans on the stage, but the performance of the media in attendance. They all sat through 30 minutes of inconsistent lies with zero new evidence, and no one held their feet to the fire. Advice to the big guys, if you’re going to send your camera crew, also send reporters who will ask tough questions. Oh, and I just found this link to video of the conference. Okay. I think I really need to start my vacation; eager to get past this summer news cycle! Watched the video. This guy is plugging left and right, WOW. I wonder if it has any correlation to the crazy creatures that washed up on shore in N.E. (which turned out to be a hoax for a new movie promo). lol. My favorite quote: “I wanna protect the species.” Which species — Big Foot, human or yours? HA. You’all won’t think its a Hoax when he is thawed out, hit with the paddles, given CPR and speaks at the Democratic National Convention. Hey I live in the mountains of North Georgia. I’d rather have a bigfoot for a neighbor than the fools I have now. Run, Bigfoot, RUUUUUN! Don’t let them get you!! !